FROM THE AUTHOR of the award winning first volume of this series, Regression Hypnotherapy, which experts have called the most important book about regression ever published, comes this second eagerly anticipated text. 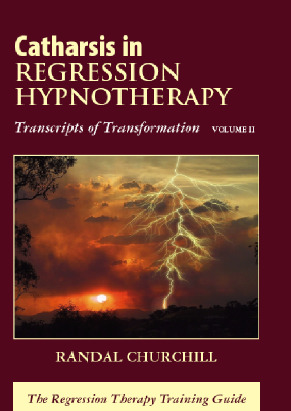 THIS VOLUME COMPLETES the Regression Hypnotherapy set, developing the comprehensive guidance given in the first volume. When utilizing hypnotic regression to help heal the effects of trauma, including with methods such as the affect bridge and Gestalt, abreaction is not a goal but naturally a common development and can be part of the opportunity for powerful therapy. While Volume I emphasizes many explorations of dealing with strong emotions, this book explores issues and examples of working through exceptionally strong expressions of emotion. AS IN VOLUME I, theory is combined with a generous series of transcripts of actual sessions with commentary, giving the reader a close-up view of a wide variety of issues and situations demonstrating the remarkable potential of this work. Unlike common regression therapy styles that avoid or discourage emotions, working through emotional difficulties as appropriate is recognized as providing potential for deeper, more comprehensive therapy, increasing the possibility for profound transformation. WITH FINE-TUNED sensitivity and skill, Randal Churchill integrates a wealth of comprehensive options for emotional clearing work in regression. Hypnotherapy, and regression in particular, can provide a safe place for the purging of repressed emotions or energy that has been internalized in damaging ways, and this can be an extremely valuable step in transformational healing. To celebrate the new release of the 2nd Edition of Regression Hypnotherapy, we are currently offering savings for Randal Churchill's books. Bonus: If you request, the author will autograph your copy to you! Randal Churchill has taught his pioneering regression processes to thousands of therapists from around the world for 39 years. Following the first volume of this deeply transforming therapy, Volume II weaves together a combination of methods that highlight powerful cathartic therapy, demonstrating the tremendous range of possibilities available in regression work. Catharsis in Regression Hypnotherapy gives the reader an inside view of the profound potential of this powerful use of emotional clearing and healing. Infused with innate sensitivity combined with skill honed over four decades of clinical work, Randal Churchill's brilliant blending of theory and practice leads therapists and students to greater understanding of their own potential to both transform and be transformed. "Offering profound teachings... a treasure whose gifts are never-ending." "Randal Churchill has given us another 'break-through' volume of his amazing publications on regression hypnotherapy. I've never before encountered such detailed, professionally impeccable, verbatim transcriptions of cathartic release therapy that convey, so deeply, a therapist's capacity for compassion, while at the same time offering profound teachings for therapists in training. Catharsis in Regression Hypnotherapy is a treasure, and a resource for the entire field of depth psychotherapy, an offering whose gifts are never-ending. In his new book, Randal's skills as a brilliant therapist are enriched by his skillful integration of Gestalt Therapy with hypnotherapy, his huge capacity for insight, and his maturity as a master teacher of his work." "Catharsis in Regression Hypnotherapy is rich in fascinating case material and instruction that teaches therapists the keys to exceptionally powerful therapeutic results. This is a major advance in the teaching literature of Hypnotherapy. Adding to Randal Churchill's Regression Hypnotherapy, this companion volume is a powerful model and teaching tool, a must read for experienced therapists and students alike." -Gil Boyne, CHt, Founder & CEO, A.C.H.E. Author of Transforming Therapy "In Catharsis in Regression Hypnotherapy Randal Churchill has written an excellent companion volume to Regression Hypnotherapy. With courage, confidence and lucidity, he consistently goes into the deepest places where his subjects have been wounded and leads them through healing trance sessions. No wonder they trust him so much as his commitment to their healing is as strong and steadfast as it is gentle and respectful." "Catharsis in Regression Therapy is an exquisitely powerful model of the healing potential of regression therapy. What better way to fix these methods into your own subconscious mind than to read and re-read these excellent examples of Churchill's innovative work. As a companion to Regression Hypnotherapy, Volume I, this work again sets the standard for our profession. I highly recommend this book to any serious hypnotherapy students and practitioners." "Containing the substance of many years of experience with clients, Catharsis in Regression Hypnotherapy by Randal Churchill is an excellent book for the hypnosis professional. Although many facilitators guide clients to avoid negative emotions, Churchill helps clients confront their emotions in order to experience catharsis and release; and he obtains excellent results. The healing power of love and forgiveness will be apparent to the reader." "This book not only identifies regression therapy practices that fail the client, but off solid and specific professional principles that avoid misleading outcomes. Randal Churchill is highly qualified to write such a definitive text-based on forty years of commendable work and teaching. His focused and highly self-critical development of techniques and their refinement is grounded in follow-up and testing with both students and clients. More than a century ago, Freud, Jung, and other analysts "rediscovered" what many traditional societies had long known: Emotional blocks based in earlier trauma-resulting in dysfunctional behaviors-could be overcome through various means of cathartic release during group and individual healing rituals. Late 19th-century analysts- working within the mores of Victorian culture-invented a more sedentary process. They learned that patients, mostly women, could be hypnotized to recover suppressed memories of childhood trauma. The setting, an authoritarian power figure, and the depth of emotion involved created conditions comparable to the freedom given the psyche through tribal rituals. The history of some 20thcentury psychological and spiritual traditions produced innumerable variations of the fundamental process of energetic clearing of debilitative unconscious memories. Among them are many superficial, even deceptive, methods whose claims greatly exceed their merits. Churchill's work stands out for its professionalism, suggesting openness to new techniques, but requiring their validation through tangible results. It requires considerable self-restraint by the therapist at two levels: Do not overpromise, and do not interject personal perspectives into the dialogue between the hypnotist and the hypnotized. While Churchill does not see his work as "past life" oriented, from time to time some students access memories that appear to be related to possible previous lifetimes. In these cases, he scrupulously uses his same neutral stance. The recovery of traumatic memories, particularly potential sexual abuse or other personally abusive situations, requires neutral attention on the part of the therapist. Churchill notes (p. 223) that "most age-regression hypnotherapy ends up focusing on memories that were never forgotten." However, it may heighten the recall of details, providing more accuracy than recall attempts in a waking state. Case transcripts-the core of the book-graphically display his sensitivity and, as seen in their reactions, his deft passing of the responsibility to the hypnotized. He sees himself as the facilitator of the individual's own self exploration. Churchill's philosophy and approach are quite conducive to realizing the values and principles associated with humanistic psychology. Based on the premise that humans are self-actualizing beings participating in a multidimensional, consciously evolutionary process, this book demonstrates a therapeutic, self-empowering tool. It ought to be on every therapist's bookshelf, whether they use hypnosis or not."